Click on the titles below to hear sample audio from our recordings. Click HERE for our CD Order Form. Or go to the iTunes Store to purchase individual tracks or albums . 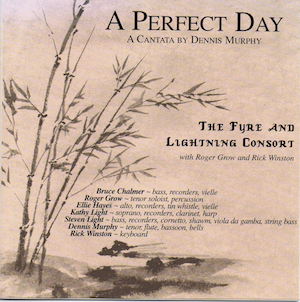 Just search "Fyre and Lightning Consort"
"A Perfect Day" A Cantata by Dennis Murphy "...wonderfully humorous, finely crafted and satisfying music. ", Jim Lowe,Times Argus We are pleased to offer our CD recording of this incredible composition. "Simply a delight to listen to!" 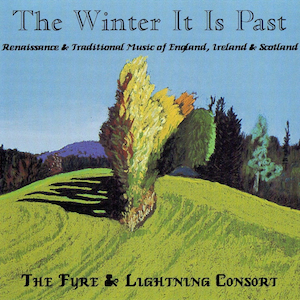 This recording features English Country dance tunes collected by John Playford, a couple of English Renaissance dances by Anthony Holborne, O'Carolan pieces arranged in a Renaissance style in 5 parts, Scottish bagpipe tunes and Irish and Scottish folk songs including the title track written by the famous Scottish poet, Robert Burns. Medieval Spain was the meeting ground of Islam and the Christian West. The history of medieval Spain consists largely of the shifting of power between the Christians and Muslims, with the Jews always in the middle. The Jews had probably been in Spain since the time of Solomon (1000 BC). Jews were instrumental in helping the Moors to successfully invade Spain in 711 AD. Under the Moors the Jews prospered. After about 1136, Judaism was again forbidden and Jews were persecuted. In 1492, the Spanish Inquisition caused the Expulsion of the Jews. Most crossed the Mediterranean settling in Turkey and around the Mediterranean basin. They carried with them an enormous body of folk songs, sung in Ladino (similar to old Spanish with some Hebrew thrown in). 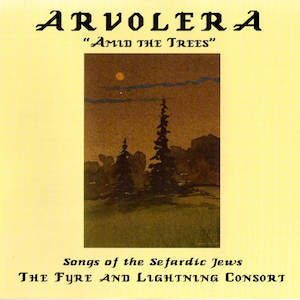 The songs on this recording are some of our favorites and portray the richness of Sefardic culture. Although it is believed that these songs were mostly sung a capella, we have arranged them for our collection of early instruments as we feel that this only adds to the power of the music. Five hundred years after Columbus, it is both fitting and important to celebrate the rediscovery of the music of the Sefardic Jews. Scalerica de Oro..."The bride has no dowry, but she has plenty of good luck!" Cuando el Rey Nimrod..."When King Nimrod went out into the countryside he saw a Holy Light"